Following a stellar second season of professional theater, Black Box Studios is proud to present a new immersive production of HAIR, celebrating the show's 50th anniversary. For 50 years the American Tribal Love-Rock Musical has been enthralling audiences with iconic songs like "Aquarius" and "Let the Sun Shine In." Leading BBPAC's tribe in "Aquarius" is Stephan Marcellus of The Voice. Stephan Marcellus is an accomplished singer-songwriter from New Jersey with performances at venues such as The Apollo Music Cafe, Carnegie Hall, and The Highline Ballroom. Marcellus is most known for his performance on the thirteenth season of NBC's television series The Voice. Marcellus artfully coins his sound alternative soul- a blend of nostalgic soul and new age rock. Marcellus makes his acting debut in Hair. "I've always wanted to act but never really had the opportunity to. After meeting Matt (Director) and Jason (Stage Manager) we developed a bond and when they encouraged me to do so I was excited to drive into something new. It's been an learning experience but Nachi (Claude/Choreographer), Static (Music Director/Bandleader) and the rest of the cast welcomed me with open arms and participating in Hair has been a great experience," Marcellus said. Joining Marcellus on stage are Sam Cancelarich, Brennen Dopwell, Kira Gavalakis, Samuel Hapner-Goldman, Nachi Lederer, Miranda Luze, Danielle MacMath, Bishon Prushankin, Camille Sims, DaShaun Williams, and Conor Wilson. 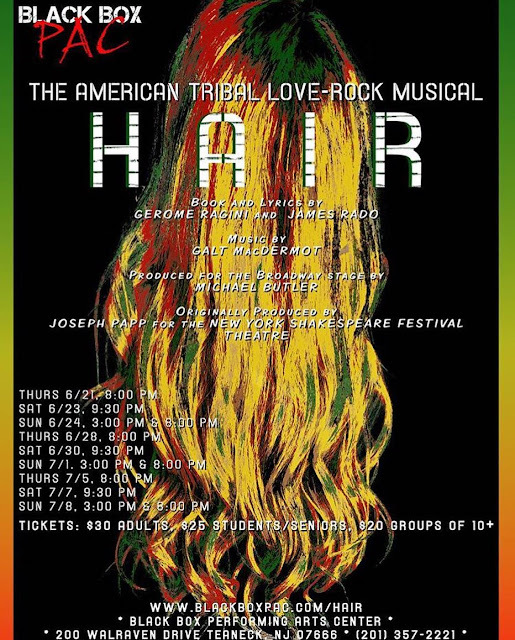 Hair - presented in special arrangement with Tams-Witmark Music Library Inc. - is directed by BBPAC Artistic Director Matt Okin, with Musical Director/Bandleader Static, Choreographer Nachi Lederer, Assistant Director Bishon Prushankin, Stage Manager Jason Felix, and Designer Nimon Ibrahimaj. Marcellus' performance is sure to captivate audiences, and he is excited to share this story: "When you look at the state of our society today from "Time's Up" to "Black Lives Matter", you understand why Hair is still so relevant. The issues then are our problems now, it shows you how far we still have to go as a society. To me, Hair is centered around people who want the fundamental right to be heard. While they are excessive in their attempts, there is so much authenticity and passion within their stories. I respect the representation of all marginalized groups and hope watching this inspires you to promote change." How: Tickets are available at www.blackboxpac.com. Group rates for groups of 10 or more are available by calling (201) 357-2221.